As we’ve seen in the past, translating from book to film can be a challenge. But translating an epic tragedy from a beloved (and much adapted) Broadway opera which was itself translated from a novel heavy on 19th century French history and you more than have your work cut out for you. Best case scenario is you gather up the one of the best casts around and throw yourself into it at full speed. The results can be beautiful. revolution of 1832. Actually, to say it’s a tragedy is putting it mildly as even the good things that occur have a pall of intense sadness over them to the point where when you see a character smile it’s almost off-putting. In fact, only 2 characters of the dozens even have a happy ending, and that after much suffering on both their parts. I do wish Hooper had let the acting and music guide the emotion though, as during nearly all of the “big” songs the camera zooms into extreme close up on the actor. It never served to create a more real moment or raise the intensity of the scene, if anything it was distracting. Similarly, not all the cast was as powerful a singer as others. While much attention will be paid to Anne Hathaway’s heartbreaking performance as Fantine, even more has been paid to Russell Crowe’s stilted and awkward Javert. Crowe is…not a wonderful singer. He’s not terrible as such, but in this role where every line is filled with gravitas his performance doesn’t fit in with the rest. Even Redmayne, who’s vocal was not my favorite, feels like he belongs in this world more than Crowe- who does actually improve throughout the film up to the cartoonish end of his story. But when you’re up against Broadway vets like Hathaway, Jackman and Samantha Barks who also played her role of Éponine in the West End and in the 25th anniversary concert, Crowe really had no chance of coming out unscathed. Speaking of Barks, her story was one of the many that was tweaked from book to stage to film. While this was my first exposure to this world (but guess what’s next on my Classics readthrough…) all I noticed was how strangely her story ended. I gather that this was a change made for the movie but I can’t for the life of me figure it out. Which brings us to the “comic relief” portion of our film. Sascha Baron Cohen and Helena Bonham Carter play the deliriously amoral Thènardiers-innkeepers and conmen extraordinaires Whenever they appear on screen the mood lightens considerably and you can tell the two had the best of times filming their scenes. While they’re important to the story (they are the parents of Éponine and Gavroche (Daniel Huttlestone) among other reasons) when they appear it’s like a different movie has begun and you’re just along for the wacky ride. No matter how disgusting their actions, they were a joy to behold. **A Note on the Soundtrack Album: The official soundtrack album is, as it should be, a highlight album. It is not the entire movie on CD. 20 tracks beautifully mastered. 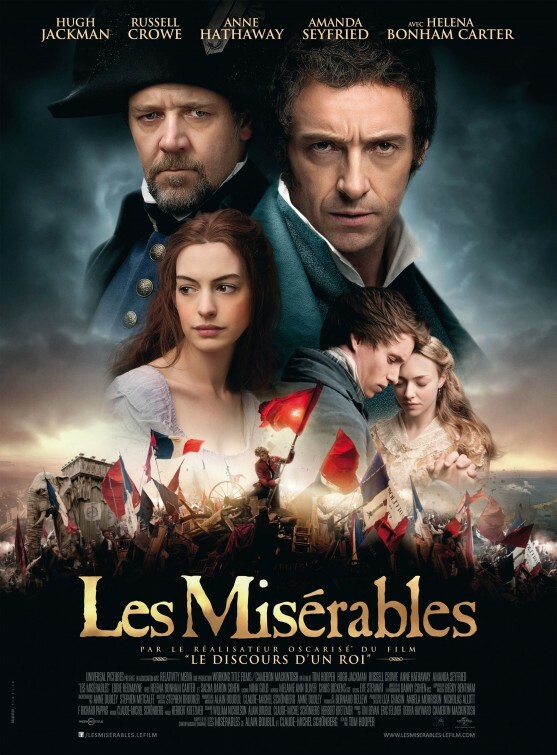 Sadly, my favorite song in the film, “Do you hear the people sing?” is not included for some reason-nor is the reprise of “Look Down” with Gavroche, Marius, and Enjolras. Terrible decision on both of those counts.